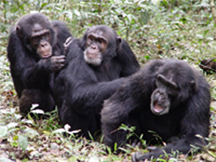 Three adult male chimpanzees in Kibale National Park, Uganda, during a grooming session. The human patterns of social reciprocity are not solely human. They can also be found, for example, in chimpanzees, which exhibit reciprocity with respect to grooming and food sharing. See Kristin E. Bonnie and Frans B.M. deWaal: "Primate Social Reciprocity and the Origin of Gratitude," in The Psychology of Gratitude, Robert A. Emmons, Michael E. McCullough, eds. New York: Oxford University Press, 2004. Order from Amazon.com. Photo by John Mitani, courtesy WhyFiles.org. When someone at work asks for a favor, you might grant it on the grounds of friendship, teamwork, or affection. But at times, we receive collegial or businesslike requests for favors from people who are neither friend nor foe. Let's assume that there are no ethical questions involved; that it would be perfectly proper to say either yes or no. To decide what to do, consider both your choices and the seeker's. What are your choices? If the effort involved is minimal, and if the negative consequences to you are minimal, granting the favor is a good choice. Otherwise, think about another option. People sometimes get unhappy when we say no, and sometimes they act out of anger or disappointment. Denying a favor can have negative consequences, but if you're sure nothing too terrible will happen, denying the favor is a possibility. You might suggest that it isn't convenient or possible right now, and suggest that the seeker contact you at a future date. At that time, you can start all over again. If granting, denying, and deferring aren't appealing options, perhaps you can offer something else instead. Figuring out what to offer is easier with help and advice. You can ask the seeker directly, or consult someone you trust. And what are the seeker's choices? In part, your decision depends on an assessment of the seeker's response. We can classify the responses of seekers in four patterns. If you grant the favor, the appreciative seeker expresses appreciation and returns the favor immediately, or at least, someday soon. If you don't expect an appreciative response, and you aren't indebted yourself, exerting significant effort might be unwise. If you don't grant the favor, the vengeful seeker might extract a price from you, or threaten to do so. If you expect a vengeful response to a denial, deferment, or counteroffer, it's wise to search for a low-effort way to satisfy the seeker, especially if the seeker is more powerful than you are. The thoughtless seeker accepts what you offer with little expression of appreciation. Granting big favors to the unappreciative gets tiresome quickly. Find a low-effort way to satisfy the thoughtless, or consider denial, deferment, or a counteroffer. The passive seeker doesn't mind much when you deny the favor. It's tempting to simply deny the requests of the passives, but take care. Passivity can arise from powerlessness. When it does, and when it's coupled with a long memory, vengeful payback at a later date is always possible. Would you like to see your comments posted here? rbrenKjpREgyHXMxPzfRQner@ChacWyVwqUcQTBjzilyHoCanyon.comSend me your comments by email, or by Web form. I offer email and telephone coaching at both corporate and individual rates. Contact Rick for details at rbrenlpuKRLFTltzUXaxbner@ChaceLcLHCGKHrIQSHEFoCanyon.com or (650) 787-6475, or toll-free in the continental US at (866) 378-5470.